In Alex Majoli’s exhibition SKENE, a term referring to part of the structure of an ancient Greek theatrical set, the Magnum photographer has fixed a wide swath of humanity – from India to Egypt to Germany – within the contours of an aesthetic more common to the stage or screen. The 16 photographs, on view at Howard Greenberg Gallery through April 1, span 15 years, but his vision is remarkably consistent. All the images are black and white, impeccably composed, and filled with shadow – the result of adjusting his exposure to accommodate a heavy flash. Majoli seems determined to demonstrate his connection to dramatists more than fellow image-makers. On a back wall in the space, he has emphasized that point through a sort of concept board modeled on his own studio with images of theatrical productions – of Hamlet, among others – tacked alongside smaller prints of his own. If one were searching for Majoli’s photographic forebears, however, one need not look further than the next room over, where the gallery is concurrently showing work by Arthur Fellig (Weegee). Like Weegee, Majoli is fascinated by the spectacle of modern civilization’s darkest scenarios. But while Weegee was known to move crime scenes around to suit his needs, Majoli lets the presence of his camera and his flash-wielding assistants shape the reality before him. Working slowly and openly, Majoli gives the people in his scenes the opportunity to leave if they don’t want to be photographed. Those that remain know they will be seen, and the impact of that awareness is particularly pronounced in moments of already heightened emotion. In a photograph of refugees arriving on the Greek island of Lesbos, a mother and father holding their sick son seem to implore not just the nearby authorities, but Majoli as well, and by default, the viewer. Elsewhere, the narratives of Majoli’s photographs are more obscure. 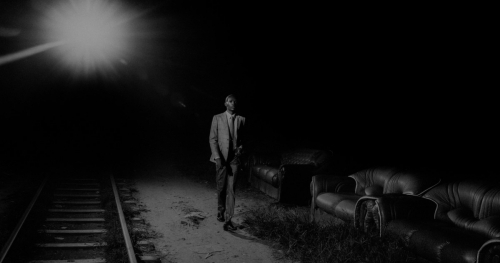 In the Republic of Congo, a man walks along railroad tracks flanked by sofas. In China, a woman in a fish market looks anxiously off stage, as it were, toward some unseen source of concern. Darkness covers all these photos equally, like a shroud, which might make them unusual by traditional documentary standards, but powerfully theatrical in a gallery setting.